01. 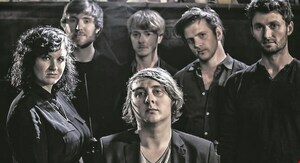 Long-running, underrated road warriors of Leeside-based guitar noises, are John Blek and his Rats. 02. After an extended period of solo touring around Europe, the band is back on the road with an extensive transnational run of dates. 03. Streaming above is the video for last year’s single Dead Friends, taken from second band album Borders. 04. They perform this Sunday at the Cork Opera House, as part of Right Here, Right Now festival, in a double-headliner with The Shaker Hymn. Thoughts: Weighty, folk-tinged guitar-pop tempered with a double-dose of reality. Posted in Music, You May Like This and tagged indie, Ireland, John Blek, new Irish music, new music, pop at 11:22 am on April 27, 2017 by Broadsheet. [Portland, Oregon] First solo work from Cork-based John Blek well worth a listen. Also check out his contemporary country and Irish melancholy work with The Rats (my bro’s the drummer). From the album Cutting Room Floor. Video by Barra Vernon. Posted in Music, Video and tagged John Blek, single at 9:08 am on December 1, 2014 by Broadsheet.